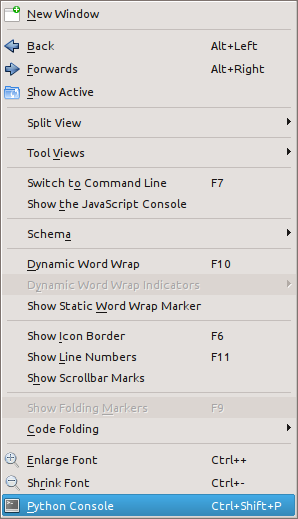 With KDE SC 4.9 around the corner and according to tradition, it’s time to have a look at what’s new in Kate. 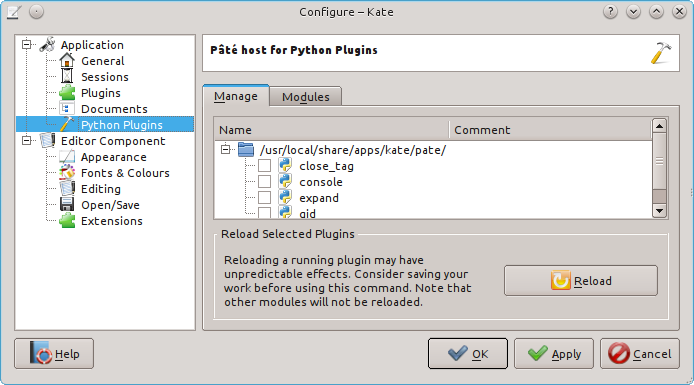 KDE 4.9 has branched, and so the Pâté plugin “host” for Python plugins has moved from Kate’s playground to be a mainstream plugin. Since a plugin-for-plugins might be a bit confusing, here is a quick tour of how it is managed and works, and especially a few rough edges it still has. 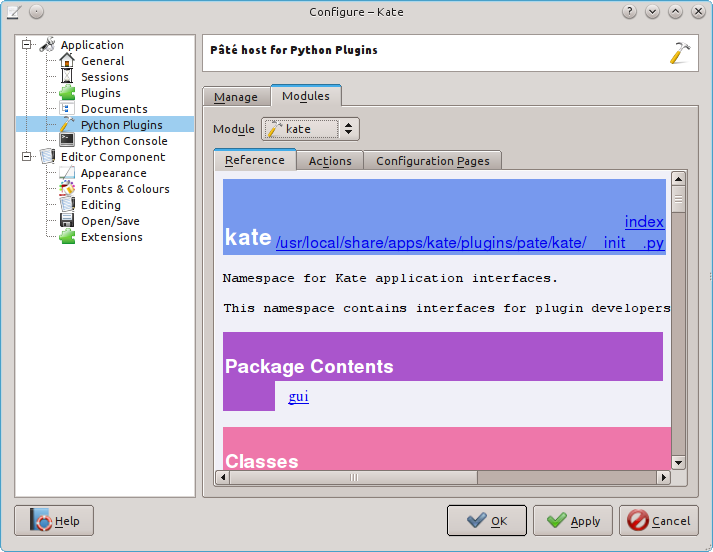 NOTE If you’ve installed this from a package, hopefully your distro will have added kate.so under PyKDE4 as needed, but if you are building from source, see the notes at the end of this post. 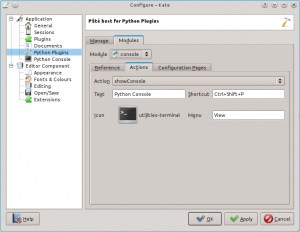 > Could not import kate"
Note that just having this location in PYTHONPATH and/or in sys.path does not work because the PyKDE4 needs an __init__.py to be seen (see the one in the system directory to understand why). I’ve not thought of a good way to simplify this for developers, and I assume end-users won’t see it because we’ll install in the default path. Suggestions/fixes welcome. 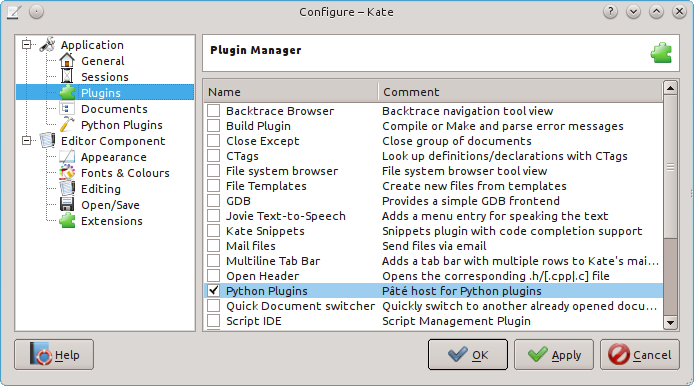 So there I am, a confirmed Kate user, and now I need to find my way around a codebase of over 100,000 files using GNU ID utils. 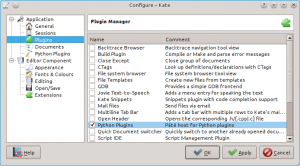 The rather crude answer for Kate 3 was to write a wrapper around the lid(1) utility and the DCOP scripting interface of Kate, all driven from the built-in Konsole. The result was clunky but somewhat usable. But Kate 3? In 2010? Because the version of KDE on our primary development environment is the venerable KDE 3.3! But help is always welcome to do better (How *should* i18n be done? What might Python 3 involve? What about some decent developer docs?). Any takers or clues much appreciated! 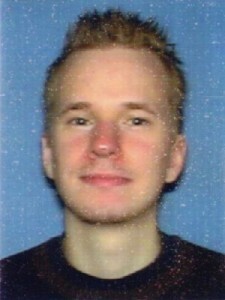 My name is Vegard Øye. I am a computer science student at the University of Oslo, Norway. I also have a bachelor’s degree in electrical engineering from Sør-Trøndelag University College in Trondheim, where I programmed for integrated circuits. It was a lot of fun, so I decided to embark on a grade with an even larger emphasis on programming. My goal is to make modal editing more widespread outside of Vim. 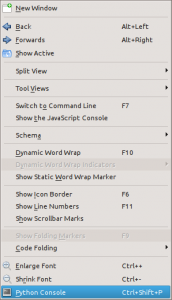 There is a Zen-like benefit to using a tool that does just what you tell it to – slicing and dicing text with surgical precision. 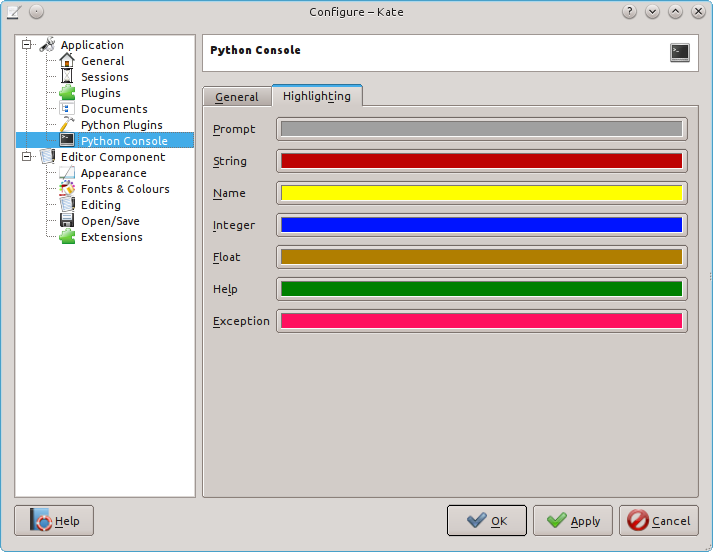 My focus is not on adding new features to Kate (although I have implemented a few), but on sharpening existing functionality. 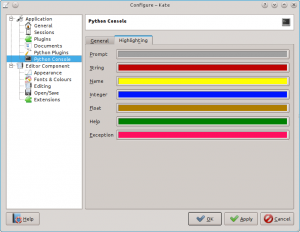 In particular, I want to improve the integration between Kate’s vi mode and its extension system, as well as sort out various bugs pertaining to the vi mode. Vegard has already done some really great work, and his changes should be trickling in to Kate’s git repository the next weeks. 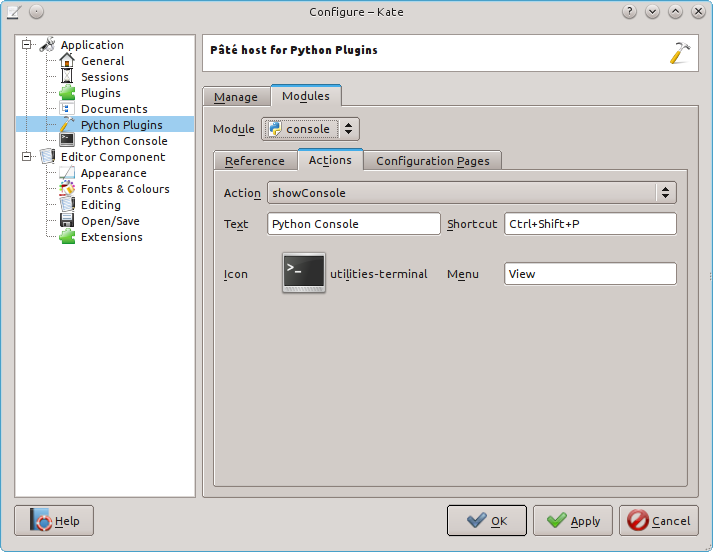 You can follow his work at http://quickgit.kde.org/index.php?p=clones%2Fkate%2Fvegardoye%2Fvegard_gsoc_2012.git.